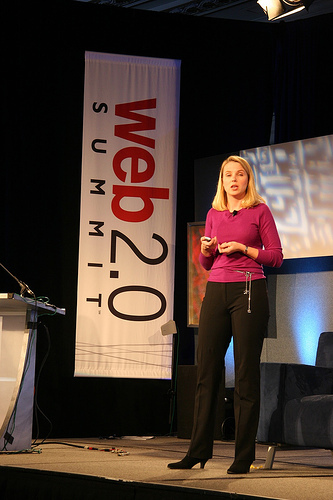 According to Marissa Mayer, the chief executive officer of Yahoo, Inc., they plan to strengthen their ties with Facebook, Inc., as well as focus on their mobile applications. Mayer explains that there are many strengths of Facebook that are also available to the users of Yahoo. She adds that they are eager to build upon these strengths, as they are truly committed to delivering valuable and relevant content to their many users. Mayer’s statements were given during a conference held by Goldman Sachs Group, Inc. in San Francisco recently. Mayer became the CEO of Yahoo last year, and since then the company has given up some shares on display ads. Based on reports from the research firm EMarketer, Inc., from 9.3% in 2012, Yahoo’s share in the U.S. market will drop to just 8%. On the other hand, Facebook’s share will slightly increase from 14% to 15%, while Google, Inc. will also boost their shares from 15% last year to 18% this year. At the moment, there are about 60 to 75 or so applications on Yahoo. However, Mayer states that they intend to focus on just a dozen or so of these applications, specifically those apps that a lot of people use most of the time on their smartphones or tablets. This is so they can attract more advertisers and users in the United States.